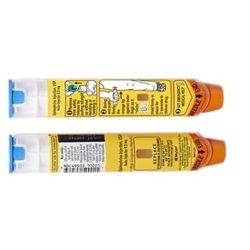 Generic Epinephrine 0.3mg in 0.3ml adult size auto-injector tube. Yellow in color. Is an alpha- and beta-adrenergic agonist. Manufactured by Mylan Pharmaceuticals. NDC: 49502-0102-02. Comes as singles.